The 5th BRICS summit, held this time round in Durban will begin in a few days, the picturesque South African coast will play host to the big players of the developing world, who will sit down and shape the future of cooperation between the world’s biggest emerging economies. Many commentators have pointed out that the BRICS summit is just a talking shop, whose members have very divergent interests, but at this summit there is the prospect of a brand new institution being created. The proposals for new BRICS Development bank will be discussed, and although nothing is definite or decided yet, it is an idea which is fast gaining traction. Since the end of the World War Two, Western nations have been behind the formation of development institutions to assist the global South. The World Bank, the IMF, the Inter American, European, Asian and African Development Banks have all been created and dominated by Western leadership. Currently it is unclear what the new bank will do, but some of the ideas on the table are a reserve currency pool for members that run into financial difficulties, something which would create an overlap or place it in competition with the IMF. Another potential role is that of aiding African infrastructure and industrial development – something which is of course badly needed, but it is difficult to see the Russians, who do not have any strategic interests in Africa being too supportive of their funds being used for this purpose. Another idea is a currency swap pool, which would help countries use alternatives to the dollar for trade arrangements, which many would read as a precursor to the internationalisation of the Renminbi. Whatever strategy the bank takes, it represents developing countries taking financial and economic leadership away from the West and its institutions. The other big question is the leadership of the bank, which country will put up the most capital (China would be the favourite in this regard)? Or will all countries put in equal capital, a costly proposition for the others. Would other countries allowed to become shareholders? If not would it represent the BRICS taking leadership of the developing world? 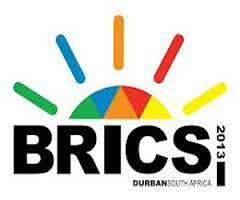 Whatever happens the creation of a BRICS bank will be a major milestone in the narrative of South – South relations. Next Next post: Sri Lanka: Can the peace dividend continue?